Shakespeare knew the Earth was round. Puck in A Midsummer Night's Dream says (Act 2, Scene 1) "I'll put a girdle around the Earth in 40 minutes'. In Henry IVth Part 2 (Act 3, Scene 2) he writes of 'This world's Globe', In The Comedy or Errors (Act 3, Scene 2) Shakespeare writes 'She is spherical like a globe' and in Trollius and Cressida (Act 1, Scene 3) Ulysses says 'This solid Globe'. Christopher Columbus in 1492 also knew the Earth was round as did his sailors. The story about the sailors being fearful that they would sail off the edge of the Earth was only written in 1828 by Irving Washington in his book about Columbus, but it has been repeated so many times that many people believe it to be true. Columbus did miscalculate the size of the Earth and thought he had ended up in Asia instead of the West Indies but he still thought the Earth was round. Navigating from Europe to America was difficult but there were a few navigation tools that Tudor sailors could use. 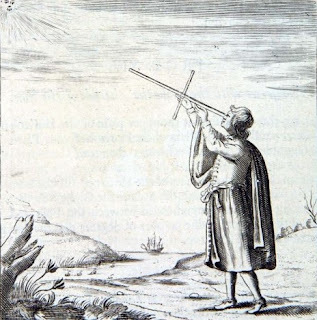 Amongst these was a Nocturnal which could be used at night to determine the time by aligning the arms with Polaris and the pointers of the Plough. There certainly was a Nocturnal on the Mayflower in 1620 and earlier ships carried them as well. One of the other navigational implements available to the Tudor seafarer was a Cross Staff. The major disadvantage of the Cross Staff was that the users had to look directly at the sun. 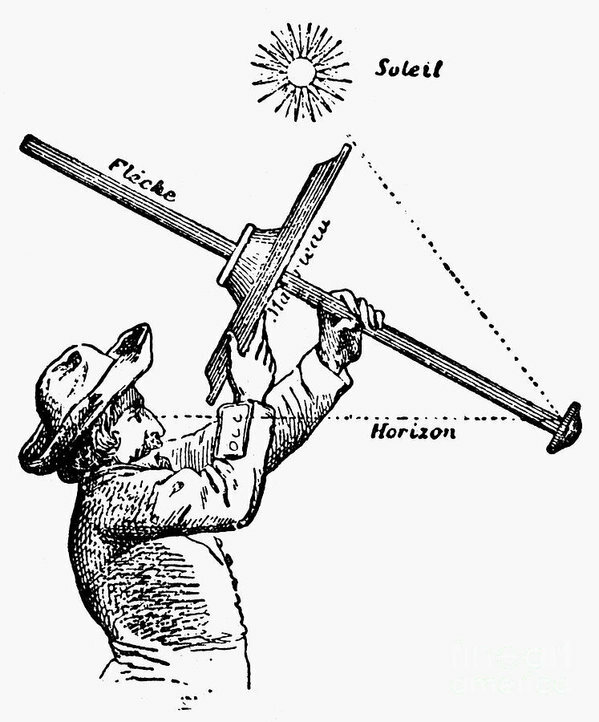 In 1594 John Davis invented the Back Staff. 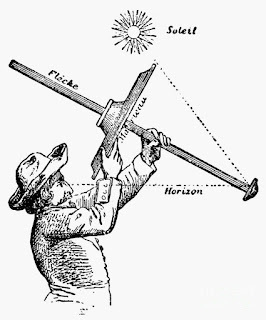 This was easier to use as the sailor stood with his back to the Sun and measured the shadow cast onto the calibrated horizontal section. This is not unlike the Digges-Bourne Telescope where the observer looks backwards into a mirror. So how did some sailors navigate across the Atlantic to the Americas in the late 16th and 17th centuries? By looking backwards though a Back Staff.